Since 2011, when Sony announced their first consumer 4K projector, I've been looking forward to JVC countering with a sensibly priced 4K projector of their own. Out of the three new native 4K models announced at 2018's CEDIA Expo, the JVC DLA-RS2000 piqued my interest the most. This is the company's mid-tier model, which seems to offer the sweet spot in terms of performance versus its asking price of $7,999, with a compelling combination of class-leading brightness, contrast, and native 4K resolution. Prior to this, no projector offered all three of these traits. You could only have two. These new projectors constitute a major leap forward in many ways over anything JVC has done before. They've redesigned this new lineup from the ground up, keeping elements that have worked well in the past, while fixing several issues with previous models. More on that later. The RS2000 (also sold as the DLA-NX7, depending on the market) uses JVC's new third-generation native 4K D-ILA panels. The company claims advancements in planarization help reduce light scatter and light diffraction to increase contrast performance over the previous generation 4K panels found in their flagship RS4500 laser projector. Additionally, JVC is using a brand-new light engine design with higher performing wire-grid polarizers and tighter quality control over the lens. The net result is a more efficient projector producing a sharper image with more contrast and light output. One focus point JVC had this year was improving HDR10 performance. This is a sore topic for projector owners, since even with a claimed 1900 lumens on tap, the RS2000 falls drastically behind most flat panel TVs when it comes to image brightness. Even on a modestly sized projection screen, most users won't see more than 200 nits of peak brightness. This is a far cry from flat panels reaching over 1000 nits. The fix is JVC's new auto tone mapping software. This new software can automatically adjust the dynamic range of HDR10 content to better suit the brightness capabilities of the image on screen. This new feature aims to bring the already stellar SDR performance JVC projectors are known for to HDR content. The RS2000 is a relatively large projector, measuring 19.8 inches by 19.5 inches by 9.3 inches, with a weight of 44 pounds. This makes the RS2000 over 30 percent larger in volume and more than 9 pounds heavier than JVC's previous generation lamp-based models. 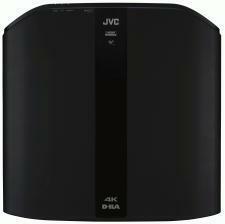 JVC claims this new larger chassis design helps for better airflow and less audible fan noise. The RS2000 employs the same fully motorized lens from previous years, offering 2x zoom, a 1.4 to 2.8 throw ratio, and a generous ±80% vertical and ±34 percent horizontal lens shift. JVC claims 1900 lumens of light output, >100 percent P3 color gamut support, an 80,000:1 native contrast ratio, and an 800,000:1 dynamic contrast ratio. The 265-watt UHP lamp is rated for 4,500 hours. On the back of the projector you'll find two 18 Gbps HDMI 2.0b ports, a 3D emitter sync port, a USB port for firmware updates, a 12-volt trigger port, an RS-232 port for legacy system control, and a LAN port for IP system control. I found the redesigned, backlit remote control included with the projector to be intuitively laid out and comfortable to hold. The centrally mounted, fully motorized lens also makes setup a breeze. It took all of two minutes to achieve a proper image size and focus on my screen. Setting focus correctly is something I find particularly important with native 4K projectors to gain as much benefit over 1080p as possible, and in the past, JVC has been a class leader when it came to pixel delineation and focus uniformity across the image. The RS2000 is no different. The lens on the RS2000 had no issues focusing tightly across the whole image, which really lets you take advantage of all 8.8 million pixels. Convergence, once the projector was warmed up, was also excellent. Should your projector come with less than ideal convergence, correction software is included to fix any deficiencies. The menu system of the RS2000 is well laid out, with options unambiguously named to avoid confusion about what each one does. Such options include basic Brightness, Contrast, Color, and Tint control, and myriad other picture controls are available for more advanced calibration. Preset color temperature options range from 5500K to 9300k, preset gamma options range from 2.2 to 2.6 with additional HDR gamma presets ranging from 1.8 to 2.6 in the user settings, and you have several preset color gamut options to choose from, including REC709, DCI-P3, and REC2020. JVC includes different preset picture modes that are tailored towards different types of content. Natural mode is best for REC709 SDR content, while HDR10 mode is best suited for HDR10 content. There are also six User modes that allow you to custom set a combination of settings to memory. On top of all this, there are custom modes for gamma, color temperature, and color gamut that can be altered through calibration. Simply put, the RS2000 allows unprecedented control over almost every aspect of its image should you feel the need to venture past the preset factory picture modes. New this year is something JVC refers to as Installation Modes. These are memory slots that allow you to customize up to ten items found in the menu system that aren't image settings. Some of these items include digital mask, lens memories, anamorphic stretch modes, and 12-volt trigger modes. JVC has listened to the criticisms of previous models and set out to fix several with this year's models. HDMI sync times, the time it takes for the projector to lock onto a signal and display an image, has been dramatically improved. It now takes less than 10 seconds for an image to be displayed on screen after locking on to a signal. Those who switch between sources or channels with different frame rates and resolutions often will be happy with this improvement. JVC has also completely redesigned their proprietary C.M.D. (Clear Motion Drive) software, which is what JVC calls their motion smoothing software. They claim fewer artifacts and subjectively better motion, and the software now supports resolutions up to 4K (4:4:4 chroma) at 60p. This is a welcome improvement for those who plan to game and watch sports at 4K resolution on the RS2000. As mentioned earlier, this year we see the inclusion of what JVC refers to as auto tone mapping. Projectors are often criticized as having an overly dark appearance with the HDR10 content. JVC has now implemented software that will automatically adjust the HDR picture settings to best match the image characteristics the HDR10 video has. This is done on a video-by-video basis by looking at the static HDR metadata sent from certain source components. Through this metadata, the RS2000 knows the maximum and average light level of the video and adjusts the picture settings automatically to best suit the content on your screen. HDR10, in general, is an overly complicated and technical standard, and through this new software JVC is trying to take as much guesswork out of the equation as possible and automate things so their projector owners need to do as little as possible to get the best image.